London's blue chips climbed higher on the back of gains for resources companies and a fall in the pound on Thursday amid increased Brexit uncertainty, which saw pressure on the more domestically flavoured mid-cap index. 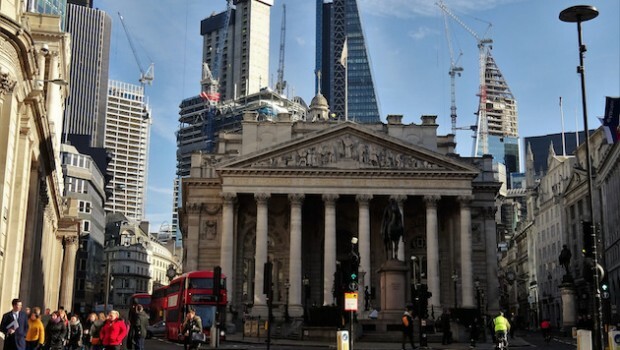 Just after midday, the FTSE 100 was up 0.4% to 7,320.45, while the FTSE 250 was down 0.7% at 19,255. The pound was down 0.6% against the dollar at 1.3118 and 0.4% lower versus the euro at 1.1520. The Bank's monetary policy committee was unanimous in its decision to maintain the status quo for now. But the MPC did forecast UK economic growth of 0.3%, stronger than the 0.2% previously expected. The unanimous vote was as expected, said analyst David Cheetham at XTB. "It’s not surprising the bank have decided to remain in wait-and-see mode given the major political uncertainty at present, and don’t expect anything drastic from them until there’s greater clarity on Brexit. The market reaction has been pretty quiet with the GBP/USD rate remaining near its lowest level of the day." FOMC members also agreed to take the shears to the Fed’s personal consumption expenditure (PCE) inflation forecast, dropping it to 1.8% from a previous 1.9%, while its core PCE estimate remained at 2%. In the post-meeting press conference, Fed chair Jerome Powell said there was "no need to rush to judgment" when it came to its more cautious stance, with the Fed’s policy on its balance sheet set to ensure a “smooth [and] predictable” end to its runoff. Above and beyond the BoE announcement, the big focus will be on Brexit news as EU members prepare to decide whether or not they will allow Theresa May’s request for an extension of Article 50 to 30 June. May was set to travel to Brussels later for the EU leaders summit after EU Council president Donald Tusk said on Wednesday that he would consider approving a delay, but only if a deal was voted through by MPs first. The summit comes a day after May said in a speech that she would not tolerate a longer extension, and tried to shift the blame onto MPs for failing to implement Brexit on time. CMC Markets analyst Michael Hewson said: "It is slowly becoming apparent that patience is wearing thin amongst EU leaders, and it’s not hard to sympathise with that sentiment, but putting a gun to the heads of MPs here is probably not the best way to achieve a conclusion to this particular problem." Clothing retailer Next was on the back foot as it confirmed full-year sales and profits in line with its pre-close statement in January and maintained its guidance for earnings to grow 3.6% for the year ahead. Total group sales of £4.2bn were generated in the year to January, up 2.5% on the previous year, while profit before tax was down 0.4% to £722.9m. Housebuilders were weaker after Persimmon said it was set to become the first major UK housebuilder to adopt a policy where standard contracts will include allow for 1.5% of the total home value to be withheld by the buyer's solicitor until any faults identified at the point of key release are resolved. Fashion brand Ted Baker slumped as it reported a 26.1% drop in annual profit following a "difficult" year in which it was hit by a “forced hugging” scandal that culminated in the resignation of founder and boss Ray Kelvin. In broker note action, Capital & Counties, Derwent London, Shaftesbury and Great Portland Estates were all initiated at ‘hold’ by Panmure Gordon, while JPMorgan started Assura at ‘neutral’. EasyJet was lifted to ‘neutral’ at MainFirst, while IAG was downgraded to ‘neutral’ by the same outfit. Compass was downgraded to ‘sell’ at Goldman Sachs and Lookers was cut to ‘neutral’ by JPMorgan, while Berenberg cut Merlin Entertainment and Bodycote to 'sell' and ‘hold’ respectively.